One of Tilman:s oldest hobbies is Electronics and Ham-Radio. He has gathered loads of articles and information here. I also am heavy into photography. Member of Stockholms Fotoklubb. We meet every month, discuss, look at and get inspired by photography. I´m please to say that the club is not just attracting men as members. A high percentage women are being very active. You have to have a hat on ! Tilman is having a wonderfull time being 50+ . I see load of oportunities on new knowledge, skills and challenges. Since some time now I do run my own company (ThulesiusTech AB) as a consultant in communications and electronics development. A picture from times when Tilman:s interest in hats all started. Here Tilman is about 1 year old pushing along that cart with a hat borrowed by mum. Nice isn´t it ? Here you have a picture taken in 2011 where Tilmans is wearing a Stetson. One of several hats used now. The year is 1987 and Tilman is photographed here in front of the royal estate at Drottningholm outside Stockholm. Susann is together with Tilman working hard on our own house and garden. 1987 this phot is taken where Susann (Tilman:s wife) peeks out of a tree in the garden of Drottningholm. The same year Tilman and Susann got married. 1988 the daughter Anna was born, and 1990 daughter Maria. Here you have a picture from 1962 where Helene, Tilman, Andreas and Renate where flying to Gothenbourg to visit the family of Olav Thulesius. The year is 1962 and Tilman overlooks the "raukar" at Kyllai in the North of Gotland. Maria is enyoing some music while cutting grass in the garden We are very pleased to have built up a garden with a nice comfort to us. 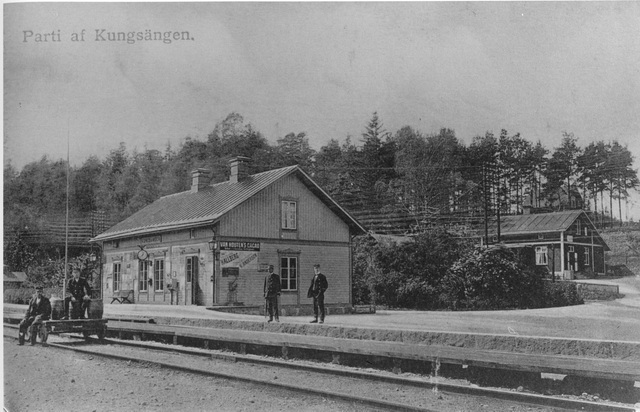 This is how Kungsängens station looked like 1880, more then hundred jears before we moved to Kungsängen 1988. If you want to see pictures from Kungsängen station sinse then you can have a look here.